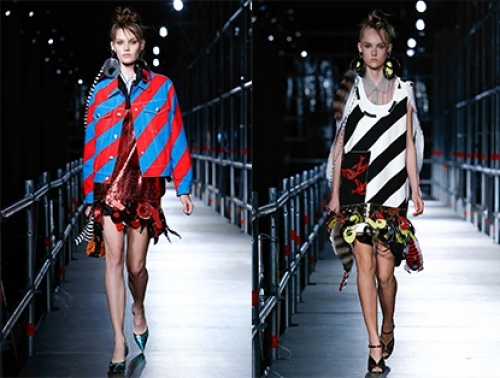 With the aim to bring a party spirit to the runway, Miuccia Prada staged a Miu Miu club in Palais d'Iena, featuring tech house beats and performances from Seth Troxler, Frederic Sanchez, Craig Richards and Cassyy. 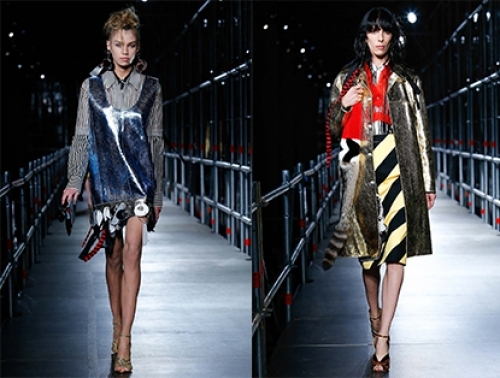 The clubbing was not devoted only to the brands' Resort 2016 collection, but it also announced the launch of the first ever Miu Miu fragrance. The resort collection itself is kind of retro-modern, highlighting the clubbing motives and youth mood. Shine metallic fabrics bring a sense of retro, while modern hairstyles add an edgy touch of modernism. 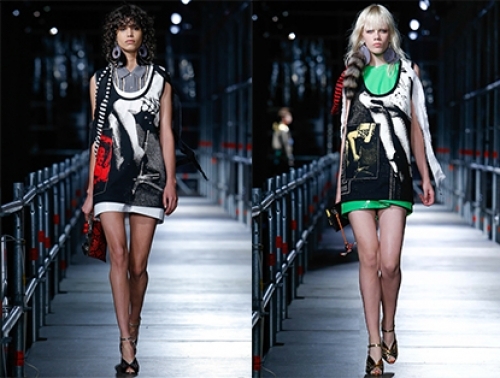 In fact, Miucci Prada brought back to the runway the prints of Miu Miu's spring 2010 collection with a fresh approach. The prints were given a rock and roll refreshment with club poster elements, leather and a lot of hazard stripes. Retro club posters opened the show, that were topped over a shirt dress or a neon color dress, giving the show a right start. It looks more as hazard signs in bold colors which is in fact a stylish touch to a clubbing spirit. 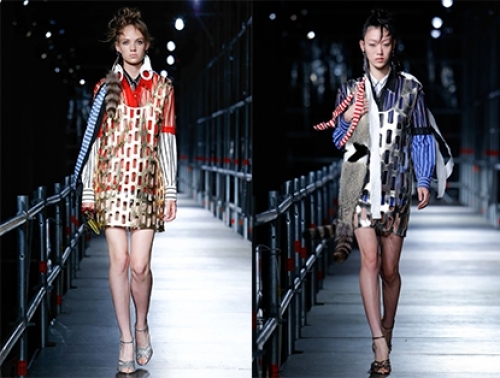 Yes, this year Miu Miu shows high proficiency in layering, even going beyond our imagination of how many layers can exist. We are used to a dress over a shirt, but it is completely new to see a shirt over another shirt and a dress. The see-through fabric of the top shirt gives a special touch to the look paired with fur and long striped fabric running from the earring. 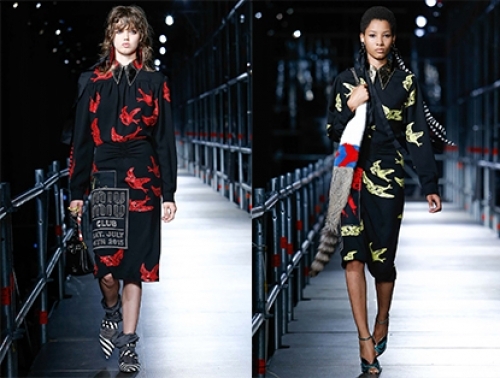 A mix of elegant black dresses wit bird prints and edgy club poster images has left a sensation. Feminine chiffon shirts topped with latex or lathe dresses in hazard stripes. Of course, metallic is the true clubbing color - the brighter it shines, the better the look is. And here is the first Miu Miu fragrance itself. Get ready to purchase it early in September.